Except for the part where four days a week I stay home instead of going to work, things seem pretty normal around here. Given the amount of time our new Carolina sleeps during the day, you could easily forget that there's a four-week-old hanging around. Instead she bides her time and stays up all night, grunting and demanding, keeping her poor parents up until that horrible hour in the morning when one of the has to get up to take the two-year-old to her daycare. It's almost like these two siblings haven't figured out yet how to coordinate their schedules yet to maximize the ease with which their parents might provide nurturing care for them. What the Hell, kids? Next week is the last week of sick leave I have left before I go to work, but that's sort of not really true because I plan to go to Austin on Monday for an NPR segment and again on Wednesday for a work day to cover Apple's very-likely tablet announcement. This week was my first NPR All Tech Considered piece since early December. I don't know how you might react if suddenly asked to go on a national radio show to talk about Haiti relief. My reaction was something like, "Ah. Could we talk about funny cats on the Internet instead?" I'm so glad we did the on-air segment, though, (and the blog entry, which has lots of great links) because I'm pretty blown away by how concerned people have been. This is despite one or two lunkheaded comments I've seen about Haiti on the various social networks I frequent. I joke around a lot about everything, but my tolerance for jokes about this is somewhere close to zero. My tolerance is even less for people who have to ask why we should bother to help people in such dire circumstances when we have plenty of serious problems here in the U.S. If I have to explain why you should help a country where 200,000+ people may have died and which many hundreds of thousands more are, literally, on the edge of death, then you are not a person that can be convinced anyway. You are not a person I can waste my time on because you don't get it. You probably won't get it, not for many years to come if at all, and I have no time for you. Haiti has no time for you. Stay the Hell out of the way. Another new thing I forgot to post about last week is a Space Monkeys! 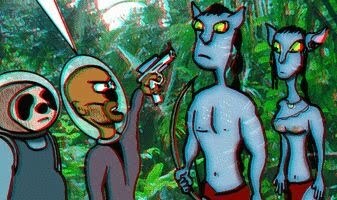 comic we did about Avatar. I still haven't seen this movie, but I hope to sometime in the next few days. 3+ hours in a theater is tough to swing when you have a newborn. Because of the time it takes to do our Trailers Without Pity videos, we pretty much put the comic on hold indefinitely. We had hoped to do a few more over the holidays, but, hey, infant. Pablo also has some things that are keeping him busy right now, so, sadly we're not able to do the comics we want to do right now. We love that universe, we love the characters, and we both hate not being able to produce comics regularly. We've been discussing ways to do simpler, more quick-hit comics, which I'm totally down with, but we'll see if it comes to fruition. For the time being, the Avatar comic will have to be a one-off holiday bonus. I'm really quite happy with the way the 3-D version of the comic (requires red/blue 3-D glasses) came out. It was pretty amazing that Pablo taught himself how to do that so quickly. He's sharp like that.